What is Marketing Automation, and who will smash the traditional market concepts of marketing and sales solutions? 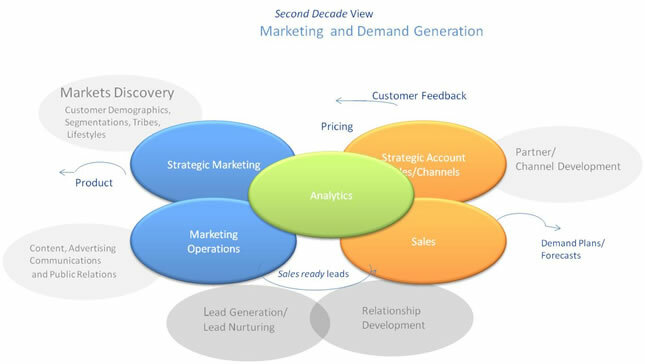 In the traditional view of marketing (Figure 1), the strategic work of marketing is a unique citadel vs. the rough and tumble of visibility and lead-gen, or the tactical marketing communications world. Most organizations have poor feedback loops between functions. Market sensing and discovery on new potentials vs. the sales reality are often person-to-person communication processes, without a shared analytic framework. So myths are prevalent. Campaigns are dreamed up and run. The true value or success of these is often dimly or not at all understood. “We loved the t-shirts.” “Our cocktail party at the trade show had a big crowd.” “The ad was funny.” But the question is, did these work? On the tactical side, leads generated by marketing operations float into sales, often poorly nurtured and not qualified, and are then lost in the sales process. Both sides can often have an adversarial relationship. “You sent us poor or not enough leads.” “You did not follow up on the leads I sent you.” These challenges between the functions often are due to the intense pressure under which both groups have to perform. VPs of Sales and CMOs both have a short life span. But more can be done to reduce the pressure, and more importantly, improve marketing and sales performance to create corporate success. Marketing today is going through a transformation, and becoming more analytic. The ability to provide exact evidentiary data of customers and their behaviors was limited in the past, before the web. So Marketing Automation is still pretty new as a technology space compared to accounting and manufacturing technologies. Marketing Automation solutions can help a great deal with the dilemma we currently have in Demand Creation (marketing to sales process). Marketing Automation reduces the stove-piped view of marketing as distinct from sales and allows visibility and data to flow between these organizations. Today, solutions (Figure 2 green coverage) exist for both marketing operations and sales. And they provide pretty good coverage of the tactical activities of the professional. Since most user organizations have not fully and smartly utilized what is available in the market today, and adoption rates are low (but growing), the leaders in the solutions market are keeping ahead of user requirements, in general. In Henry Bruce’s blog, he and Andrew Gaffney of DemandGen Report, discuss this issue. Users that are learning to master the tactics of marketing automation are having more success at lead-gen and qualifying those leads than those that don’t. But so far, they are in the minority of organizations. Says Bruce, “The market and users still suffer from people and process issues that need to be tackled before MA suites evolve further.” End-user experience should drive better and more usable functions. In addition, though there are fabulous solutions, they are not suites yet. The strategic functions of marketing and sales are not really integrated nor “aligned” says Christine Crandell, who talks about the smoking guns in this relationship. These represent different paradigms, and only manual methods generally have been used to correlate the market/customer segments with the web audience capture through to sales (see Table 1 - Marketing Automation Suite - features and functions). We think this will be addressed in time as marketing learns to master automation. Examples already exist for bridging the gap and creating the suite. Unica has customer segmentation models within the suite. Oracle bought market2lead a few weeks ago and this represents a step by a major player to take marketing automation and integrate it into the CRM/Enterprise solution. Neilson has many elements that support market segmentation and POS analysis, but does not have the B2B prowess and MA and CRM solutions. Also there is Omniture (owned by Adobe), the leading web analytics firm (with the exception of Google), demonstrating the value of digital content leverage and integration with other web marketing functions. So the integration is beginning! 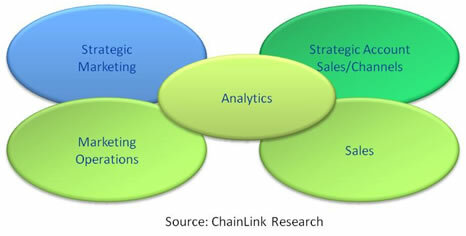 Here is ChainLink’s View of what a Marketing Automation solution should have from strategic marketing/market sensing to web and mobile marketing. Customer Segmentation - life styles, and tribes. Identifies potential markets, their value and methods to interest them. Specific spend data by channel. Smart companies analyze spending across their channels and fine tune marketing programs to enhance performance in these channels. Automation of channels/distributors through web-based unified solutions. Include microsite, lead management, marketing and promotions. Allows management of the entire channels vs. focus on certain partners. Can manage and track leads and a variety of challenging data. Landing pages with descriptive URL and linkages for SEO and tracking analytics. Should have page grader capability underneath to guage success. Guides visitors to your site. Captures specific visitor and their web behavior. This can be between sites or within your site. Across sites link graders are important to guage the affinity and value of partners, advertising, content placements, and other techniques that draw traffic to your site. Once there, the system should then track behavior on the site. Determines visitor interest flow to improve design and capture areas of interest. Using nurturing techniques you can convert visitors in a true audience. We don’t believe visitors are leads until they opt-in and declare needs. Converts visitors with defined interest to audience. This can be achieved through behavior tracking and/or specific Q&A or surveys on your site. Unlike Customer segmentation—potential market, audience is specific repeat visitors to your site. Audience classification/segmentation can specify categories and individuals. Develop, plan and deliver campaigns. Automation allows for personalized messages and can track activities and success. Relevance to audience and each media/channel. Automates, tracks opens, click thrus, etc. so you know your email was received and opened. The all important opt-out needs to be automated as well. Automate the delivery of campaign and content based on audience classifications and interests. Methods and processes for definition of requirements - from problem statement through product search. Many users have problems, but have not defined the solution. They are seeking ideas and thought leadership. Having content and workflow to address learning creates brand awareness and return visitors. Content syndication tools; search optimization automation. The web world also has a good selection of web sites oriented around content vs. commerce. These allow you to create articles, white papers and newsletters . Content syndication can be measured for click thrus. Drives traffic to your site or host content for customer/partners. Knowledge Management and directed delivery of content. Best practice has scalable feature to track leads, align areas in interest and focus, and provide Knowledge Management modules for partners to learn about products or leverage content for their sales and marketing. The ‘site within the site’ has a relevant but separate URL. Most often, these are best used for aligning partners and their products and services within your site. Automation of advertising and its distribution to publishers. Optimizes and Balances fees and audience. Finds more sources for relevant audience. Mutual sharing of processes and analytics on leads and success of campaigns, pricing and other mutual issues. Measurement and refinement of traffic to your site from search engines. Create and refine for better SEO your keywords and other techniques such as partner linking. Both natural search and paid search generate leads, but according to both WordTracker and Marketing Sherpa, your own attention to using relevant keywords is more important to success. Improves your ranking and visibility through various search services and methods. Over 80% of information on companies and products is gleaned through the web. Self service Promotions Promotion, coupons, etc. for download. Discover markets, guage wallet size/spend; measure channels, track interest to sales, and measure the performance of all the marketing techniques utilized. Analytics should unify between Marketing and Sales to track end-to-end success. Fine tunes program and campaigns, measures effectiveness of the organization and increases market share. This is particularly important to marketing departments to demonstrate their effectiveness and contribution to the organization. Directed presence on mobile devices. Mobile subscriptions - uses SMS and MMS, IM and SMS to deliver messages, promotions, etc. Mobile marketing is more permission based since users sign up for these services or alerts, vs. broad-based campaigns from email etc. Mobile and auto-id tracking as prospects arrive in your location or store. Though a new approach to audience/demographics, this is already being used by some companies and can provide powerful Demand Creation and capacity management capabilities. MA should include mobile features, and many solutions do. This is not the same as web capabilities. Mobile marketing is very attractive since it offers new opportunities for companies to understand their customers and their preferences as well as market to them in both long-term and short-term scenarios (impulse or convenience time windows). In addition, RF, Blue Tooth, etc. can be used for guided selling, stores and goods locating, and self checkout, making your mobile strategy one that requires an integrative approach - both marketing and sales. Predictions on the increase of mobile platforms as the dominant interface vary, but 2012ish, just around the corner, seems to be a target date, especially with the younger demographics. The paradigm is different, the UI is different, and so it’s time to start planning for this, if you have not. Market penetration for MA as yet is modest but growing quickly. In addition, there are many challenges associated with implementing these (or any) solutions. So, some users are turning to MaaS (Marketing as a Service) platforms. But, as yet, there is no solution we have seen that provides the full suite. The power of integration, sharing data and gleaning insights from it, is a huge opportunity. Sharing data is not a technology issue, but one that requires some change management across the functions. Once that happens, demand for suites will increase. There is so much more that the marketing has yet to learn—including a new language. Employee knowledge in some cases is astounding, but most organizations are really just learning about web 2.0 and various automation approaches. 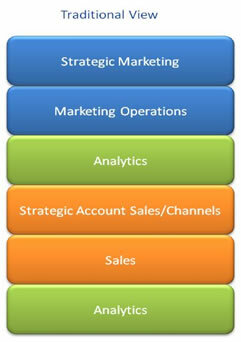 In addition, marketing needs to master the analytics and then come to the table with a new perspective. It will dazzle and impress your peers, once the marketing exec shows up with the data on where and how the company can make more money, vs. the latest colors, logos and t-shirts. In Part 3 we will talk about the Death of Demographics, the solution players, and who might smash the market. To see part one: Marketing Automation - Part 1: From Software to SaaS to MaaS. This article is part of our ongoing Cloud Series – our effort to bring clarity to these technologies.